Certified G4 Media: Traps very small harmful particles that can trigger allergies, asthma and hay fever. Disposable: Convenient and hygienic, no more washing or cleaning. Easy to install: Specially designed to fit into most eggcrate grilles. AirClean Filters™ have a high efficiency V-pleat filter designed to trap pollutants that are over 10 times smaller when compared to traditional panel filters. By trapping these pollutants, not only does the filter keep the unit cleaner and running more efficiently, but it also helps to ensure the air around us stays cleaner. These high efficiency filters are rated G4 to EN779.2012, AS1324.2 and are suitable for residential and commercial variable air volume systems. The operating face velocity ranges are from 0 to 2.54m/sec and can be used for air conditioning, heating or ventilation. 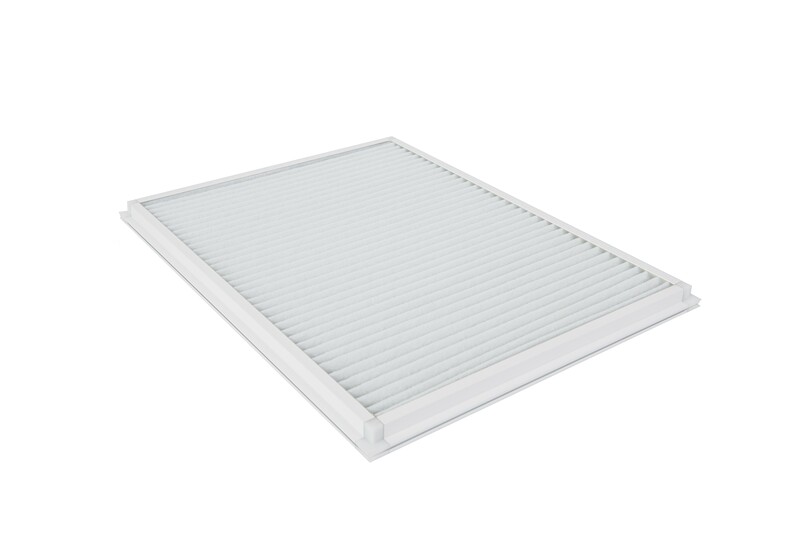 AirClean Filters are 25mm nominal thickness and are designed to easily slide into existing and new return air grilles. The 5mm and 10mm inserts can provide extra length or width if required. They are available in standard and non-standard sizes.